Believe it or not, your personal interview need not be a tense and unpleasant experience. It can not only be fun, but rewarding as well. 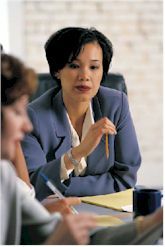 Most companies conduct a series of four to six interviews, some involving groups, some one on one. Don't be a know-it-all or a shrinking violet. Be you; confident, friendly, but not too friendly, don't outshine the people who are interviewing you, but never grovel. If you want a position, it behooves you to find out whatever you can about the business. Know the product line, corporate history and job responsibilities. If the opportunity arises during the interview to ask questions, do so as long as it relates to what has been discussed. Save your queries about salary and benefits to the final offer stage. Be on time, tardiness is a no-no. If necessary, do a dry run so that you know how to get to the location; but please, be on time. It may be the era of casual dress, but please, not on your interview. Even if the word casual attire is mentioned, wear the more acceptable conservative interview suit. Look sharp, smooth and savvy, not rumpled and confused. Once you enter that room for THE INTERVIEW, you are on your own. Be upbeat and enthusiastic; give answers that are complete, thorough and clear; if you have a record of prior commendations, awards and successes have them bound in a book for the hiring person; learn how to close the interview firmly and positively.